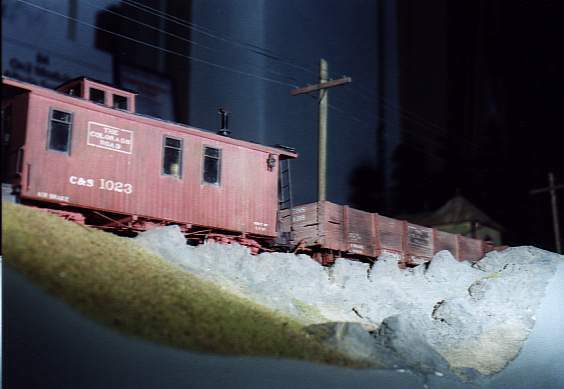 As planned, the modules where finished just in time for the10th Convention for American Railroadfans in Switzerland. On october 10 and 11, 1998, we showed the modules in Adliswil with much success. Following some pictures, which show the finished modules. They were taken in Adliswil. 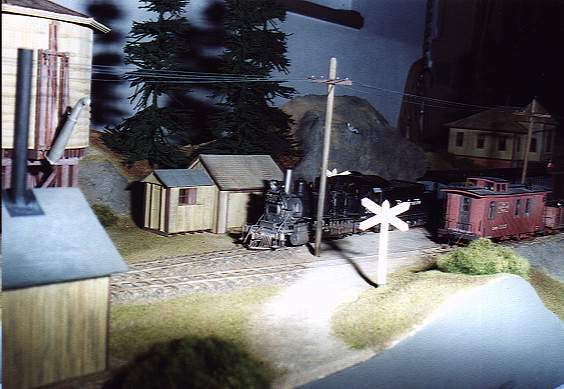 The railroadcrossing in the yard-area. This street is the only way to the station-building. 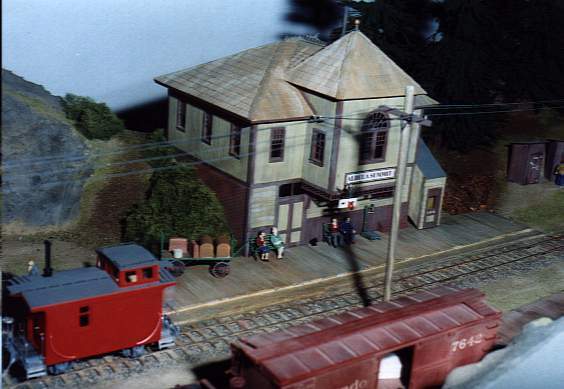 In the foreground on the left side you see the pumphouse, just across the track the watertank and the sectioncar-shed. At the right side in the background is the depotbuilding. 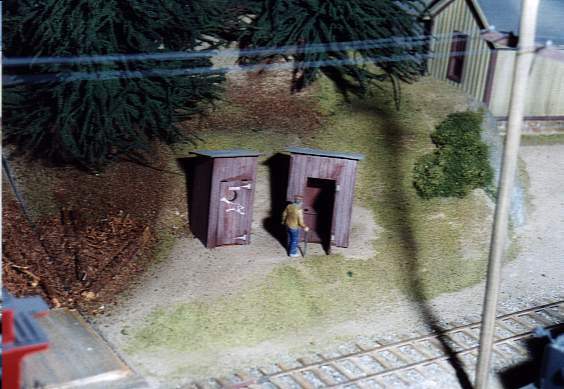 View from the south over the stockyard to the northside of the stationarea with the bunkhouse on it's raised level and the toilet-buildings at the left side of the picture. The outhouses of Albula Summit. The Goose-logos on the doors were used at the outhouses in Trout Lake on the RGS. The logos are dry-transfers from Larry Larsen from Durango. 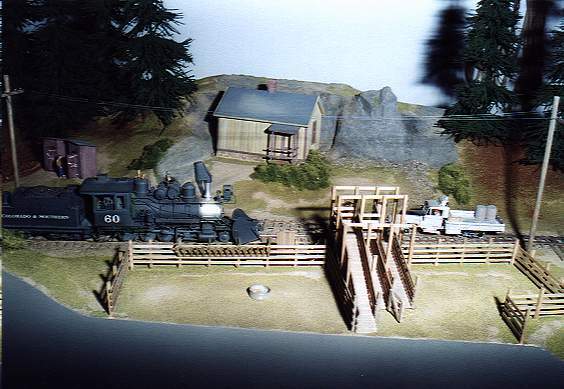 The pumphouse, circled from scratchbuild trees. 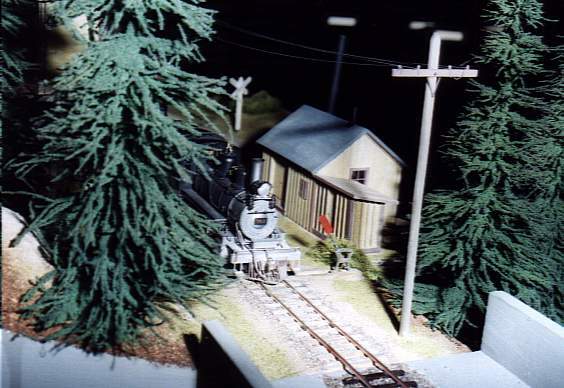 This evergreens were build from wire and rope after a method, which was shown in a Green Frog video about a RGS-layout. The trees were build by George. 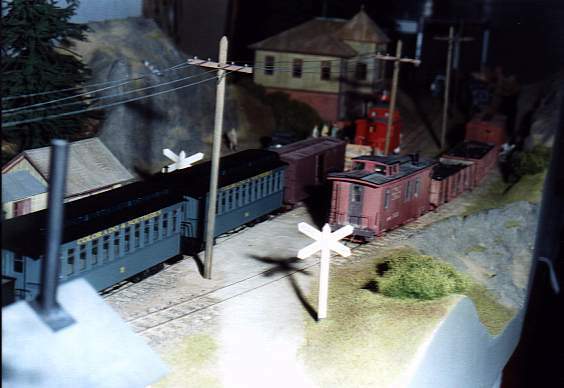 Here you can see two regauged (ex)On30-coaches from the new Bachmann-On30-set. They fit very well into the train. This is possible on modules: A picture from a very deep viewing-point.